These tips are based on the recommendations from Kean Rogers, also known as Roo. I think it is really accurate to start with, it helps me getting new gear going within a short period. Lots of experience is needed to get everything tuned up well. Proriders like Dunkerbeck and Maynard enter the water with often good tuning from start. I think the steps in this article will help most riders to achieve what pro's do. Be aware this tuning is OK for most conditions, but for special conditions you will have sometimes to take another setup, but often this is little finetuning. 1. Measure 30 cm in from the tail and measure the width of the board at this point. 2. Pick a fin with same depth as the width you measured and fit to the board. (start with a normal upright fin not a weedie). I often start with 2-3cm less than the width you measured, also I only use upright fins. A bit shorter fin is most of the time much faster on GPS, only average, upwind and crosswind speed will be less in some conditions. 3. Make sure the rear foot strap is mounted with the rear screw in line with the leading edge of the fin. 4. Set up the front foot strap by laying your arm on the board with the elbow bone in the middle of the rear strap and measure to the tip of your middle finger. 5. This point will be the middle of the front strap, mount the strap as close as possible to this position.Your board is now balanced to your body, the foot strap position will be different for each sailor. Some boards don't have a good front strap position, in these cases putting the rear footstrap a bit forward helps. 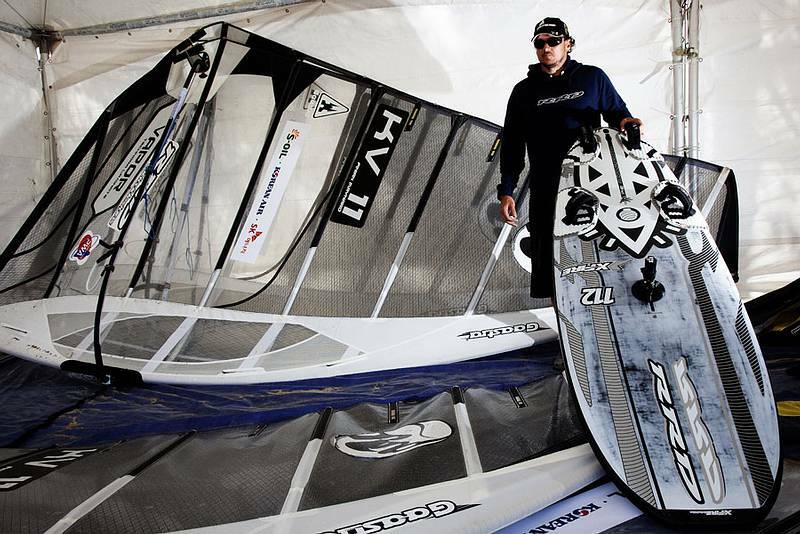 Between distance footstraps look for 36-40cm, 36cm for ultimate flat water speed till 40cm overpowered chop big slalom. A solution to put the straps back without an insert. 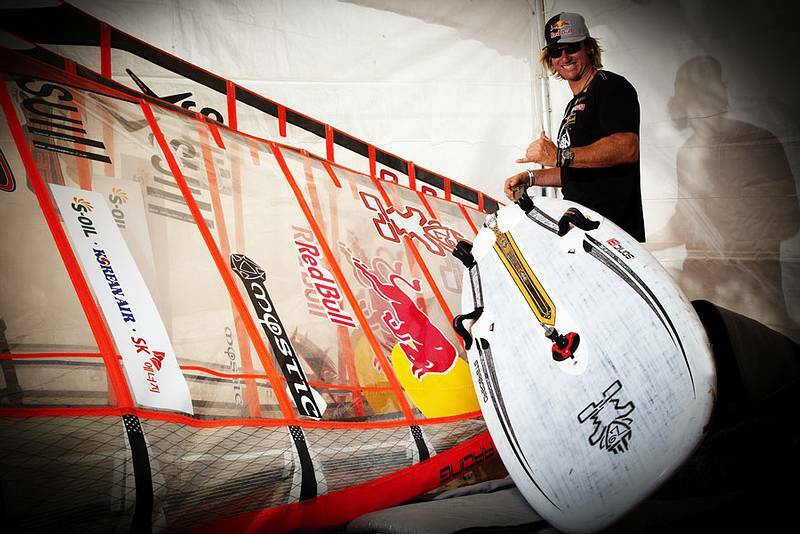 Once you’ve balanced your board it’s time to look at your rig. If you’ve set your sail up using the recommended mast and according to the measurements on the sail then it will be easy to balance it out. 1. Take your fin out of the board and connect your sail to the board with the mast foot in the center of the mast track. 2. Stand the rig up and with the board on a flat surface, i.e. grass or your board bag for protection, stand on the board with your feet either side of the mast foot. 3. Move the boom until its around shoulder to chin height. 4. Lay the rig down and measure from the front of the mast at the boom to the clew eyelet. 5. Divide this distance by three and measure from the front of the mast at the boom back this distance. 6. This is where the center of you harness lines should be. Grip the boom here with both hands thumb to thumb either side of your measurement point and place the harness lines either side of your hands. 8. Most sails have their max draft around 33% so this is a good balance point for most sails. Downhaul, battens and outhaul influence the max draft, I often used less downhaul to move max draft forward. 9. With the board and rig still connected, lay the board on its side and the rig on the ground, tilt the rig towards the back of the board until the gap is even between the foot of the sail and the deck of the board. 10. Your mast foot is in the right position if you take a line perpendicular to the board, i.e. at a 90 degree angle, from a point midway between the front and rear foot straps and it lines up with the center of the harness lines. If the center of the harness is too far forward move the mast foot back, if its too far back move it forward. This is a good one, I mostly use a bit behind the midpoint between footstraps. It is hard to reach midpoint, but if you do it will be verrrry balanced loose and fast. 11. Put your fin in the board and go sail to see how it feels. Now you have a reference point you can set the board at each time you sail, it makes it a lot easier to fine tune your equipment for optimum performance for the conditions. Remember if you’re not fast…you’re last! Great tips :) Thank you for sharing. Erik, The tips will be of great help. However I'am that sad about the local weather, that I doubt if using the tips will be possible in due time. Also refering to your post about the weather of june 6, I assume a relation between the number and the extension of your posts and the absence of wind useful for windsurfing. Great tips Erik, I'll go out and try them today. The recommended settings for footstraps from Starboard differs a lot from the method described here. When i follow the reccomendations from starboard then the rear screw of the rear footstrap is in the midle of the fin (and not at the leading edge). And the distance between the straps is a lot more (6 cm) then from my elbow till the top of my finger. This is measured for my Starboard 131. How is this with your 111 ? I have sailed the 131 with the starboards settings now and the set was not balanced at all (with Vapor 8.4). I had the tendency to move my backfoot forward, like the rearstrap was to much backward (this should be more in line with your settings). The next time with the 131 i will use the footstrap settings described here. I agree with your findings, on the iSonic 111 and other big boards the footstrap position has to be wider apart (not possible to sail small). Also I use the backstrap a little bit more back, but this is not for everybody as easy to handle. For a long time I use these rules and it gives a more easy trim and easy sailing. Now since a year I don't mind to use some more muscle power to keep everything going extra fast. I really do not understand what you mean by this. Check this picture I made, it should show how the change of mastfoot position makes stance easier on the board.